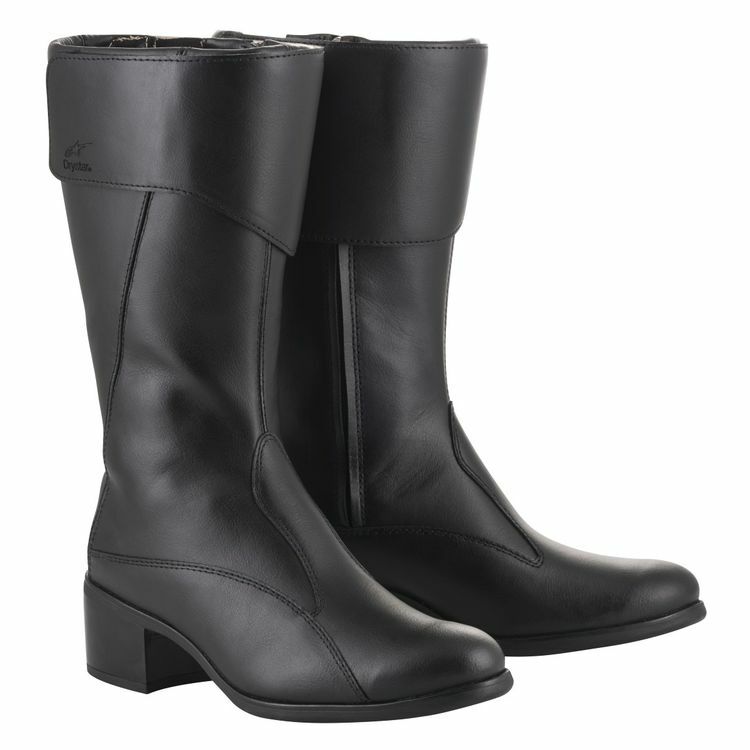 The Alpinestars Vika V2 WP Women's Boot continues to provide waterproofing and protection in a sleek classic black boot. Reinforced leather is backed by Alpinestars Drystar waterproof membrane to keep your feet comfortable and dry. Ankle disks cover your malleolus to safeguard against impacts and an internal heel counter paired with toe protection underneath the leather bolster the protection. Note: We have found the Vika Boot to be very slim through the footbed. ankle and calf, so we do not recommend it for wider feet or ankles. My Favorite Boots, by a Mile. I like these boots A LOT. You might even say I love them! The only two complaints I have are relatively minor, that being that the toe box is a bit smaller than I feel it should have been, and the top is a little bigger around than necessary (but I feel that way about most tall open boots). I wear a 41 (big feet I know), and they fit just a smidge looser than the TCX Lady Classic. The way the strap at the top wraps around is kind of genius, as it helps ensure the boot remains nice and round, as these kinds of boots sometimes have a tendency to end up a bit misshapen at the top. Overall the only thing I would really change is enlarging the toe box a little. TLDR: Might fit a smidge large, toe box could be a teensy bit bigger, but with how perfect everything else is they're MORE than worth it. I wanted to like this boot. Unfortunately, it seemed to have a really odd fitment to it that was very uncomfortable. On the bike, the ankles creased into themselves and rubbed. The rounded, thick toe made it difficult to feel the shifter, and I felt like I was clomping around when off the bike. The material is fairly thick and seems like it would provide decent protection if the fit doesn't bother you. For reference, I typically use either my Dainese Svelta or Torque D1 Out boots, and use a 39 in both (feet/ankles/calves pretty average size).